The world’s population has grown to 7 billion people; meanwhile, the industrial farm is having a hard time growing food for all of these seven billion people. Cities hardly grow food and most people live in cities. Amanda McGuinness et al.’s case study, “Sustainable Benefits of Urban Farming as a Potential Brownfields Remedy,” recognizes brownfields as a great area for farming land within and in proximity to cities. McGuinness and Mahfood state that “approximately, 80% of the U.S. population and 50% of the world’s population live in cities” (2010, p.5). 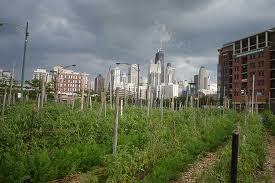 Urban farming is when cities use vacant lots to grow fresh produce. 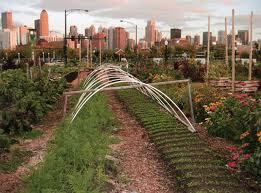 Some examples of urban farming in Chicago are Jackson Park Urban Farm and Iron Street Farm. Also, urban farming is not only a sustainable alternative to industrial farming, it is becoming more and more important because there are more people living in cities than rural areas. Finally, urban farming is an opportunity for productive land re-use because cities contain many brownfields. Brownfields are vacant lots in which the soil is polluted and which require remediation before they can be used for other purposes, such as urban farming areas. They require remediation because brownfields contain toxins that pollute ground water and soil. The toxins can be lethal carcinogens which have the potential to cause different types of cancers. There are many types of remediation: bioremediation uses bacteria to consume contaminates in the soil and ground water; phytoremediation uses plants to metabolize contaminates for the soil; and bioslurping uses pumps to degrade pumps from ground water. Urban farming is a more sustainable practice than industrial farming because urban farming uses less fossil fuel than industrial farming, in which crops are shipped long distances to food processors and to retail grocery stores. Urban farming thus “reduces transportation cost that are becoming prohibitively expensive” (McGuiness and Mahfood 2010, p.4). Industrial farming is becoming more expensive because of the cost of fossil fuel, which is making food more expensive to transport; consequently, “Urban agriculture contributes to food security and food safety by increasing the amount of food in cities” (McGuiness et al 2010, p.4). Urban farming is thus cost effective and provides more edible food directly to people than does industrial farming. In Schaumburg, the former Murzyn-Anderson facility is a brownfield. The Daily Herald recently reported about Schaumburg potentially redeveloping the former Murzyn-Anderson facility. The Village wants to redevelop the former Murzyn-Anderson facility because it is near the airport and baseball stadium. Schaumburg received a $43,000 grant from the EPA to help fund the redevelopment project. The area could become an urban farm lot in Schaumburg, among other potential re-uses. There are many models and case studies in which communities redeveloped brownfields into urban farming areas. One example is in Detroit, described in Kathyrn Colasanti, Charlotte Litjens, and Michael Hamm’s case study, “Growing Food in the City: The Production Potential of Detroit’s Vacant Lands” (pdf). The case study looked at publicly owned vacant lots from June through December of 2008 (Colasanti et al., 2010, p. 2). Colasanti, Litjens, and Hamm wanted analyze the production capacity of the vacant lots and the amount of fruits and vegetables consumed by Detroit residents annually. They stated that Detroit encompasses, “[A] catalog of 44,085 vacant parcels with a total area of 4,848 acres (7.6 miles)” (2010,p.3). Detroit has nearly eight square miles of brownfields, which have the potential to be converted to eight miles of farming area. The vacant parcels were categorized as low vacancy and high vacancy parcels. The low vacant parcels will have the potential to become small gardens; the high vacant parcels will have the potential to become large areas of farmland consisting of several acres. The Detroit case study also compared the national average of fruits and vegetables consumed with annual production of seasonal crops (Colasanti et al., 2010, p. 4). The researchers wanted to compare how much fruits and vegetables people ate to the annual production of seasonal crops because it is how they were able to calculate the production potential of each vacant lot. The amount of fruits and vegetables people ate would estimate how much food was needed to feed the people of Detroit. The production potential of each vacant lot was based on the estimated amount of food needed to feed the people of Detroit. Next, this project involved studying bio-intensive yields and commercial yields to estimate the lower and upper amounts of land needed to grow fruits and vegetables. A Biointensive yield is an organic farming practice that uses the least amount of space to get the maximum amount of crop, while maintaining healthy soil. Commercial yields estimate how much the vacant lot is worth in the real estate market. The results from the biointensive yield and commercial yield were 263 acres of high biotensive yield and 1160 acres of commercial yield can produce 31% of fresh vegetables and 17% of fresh fruit for the city of Detroit (Colansti et al.,2010, p.5). When using the biointensive yields method, they only used 263 acres out of 1160 acres of vacant lot area in Detroit. The biointensive yields can potentially produce 31% of vegetables and 17% of the fruit the people of Detroit eat annually. Also, Colasnti et al., studied how food storage would affect the production potential of the vacant lots in Detroit. They found that food storage greatly increased the production potential of the vacant lots: “[T]he use of storage and season extension where possible pushes the potential portions of the produce supplied to 76% of vegetables and 42% of fruits” ( Colansti et al, 2010, p.5). Consequently, the majority of vegetables needed to feed Detroit’s citizens can potentially come from urban farming. Moreover, urban farming from redeveloped brownfields in Detroit has the potential to feed many people. These data also suggest that the former Murzyn-Anderson facility has the potential to be a productive urban farm in Schaumburg. The facility has to feed less people than the vacant lots of Detroit, which might make the facility more successful. Also, if the facility is turned into an urban farm, it would increase the quality of life for the people of Schaumburg. The people of Schaumburg would have more fresh fruit and vegetables available, which are produced without harmful chemicals. Greater availability of locally grown fresh food can contribute to lower obesity, heart disease, and diabetes rates. 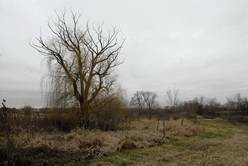 Finally the conversion of the Murzyn-Anderson brownfield into an urban farm would be a 21st century means of honoring Schaumburg’s agricultural history in the 19th and 20th centuries.